How's Your Prom Dress Coming? 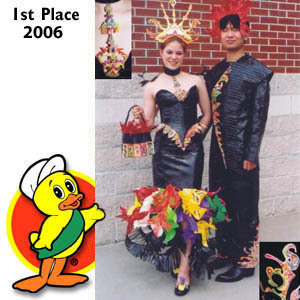 The Duck® brand duct tape Stuck at Prom® Scholarship Contest is on now - challenging high school students to create and accessorize their prom formalwear with America's favorite fix-all - duct tape. And, for the first time, this year it's the public's choice as to who's got the hottest fashions. Online public voting will decide the winning couple from the top 10 finalists. The couple winning the first place title will recieve a $6000 cash scholarship for college! Complete information is online at StuckAtProm.com and we will have more information in the March newsletter as well. For inspiration, visit our duct tape prom fashion gallery. Hi. 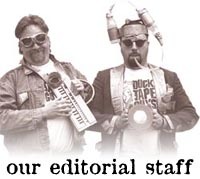 The editorial staff (Jim and me) would like to solicit your help in fixing our web site. We just changed servers and a few things got screwed up in the process. If you ever are cruising around our site and see a missing photo, dead link, etc., would you be so kind as to that you found it on? That way we can duct tape the image and or link back into place so the site is fully functioning. Thanks for the assist. Duct Shui Our thinkiest, most philosophic, but most overlooked book that we've published to date is "Duct Shui." Were we learned about the ancient Chinese practice of Feng Shui and fixed it with duct tape. Just because the critics never noticed our book, doesn't mean that you shouldn't take note of this valuable tome. Click to our Duct Shui section to learn more about Duct Shui - and while you are there, stock up on a few of the books. 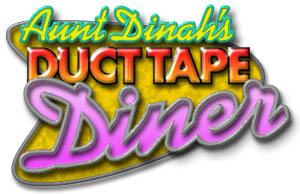 You can order them directly from our Duct Tape Pro Shop - where every order comes with a free Duct Tape Pro button and bumper sticker - and all books are personally autographed. Duct Tape your Computer Monitor? Yup! you can now have a completely duct taped desktop using one of our handy and free Duct Tape Guy desktop patterns. Just click here and download which pattern suits your taste. From massive blob of duct tape to an elegant Carpe Ductem... they are yours for the picking... FREE! 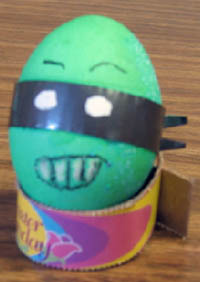 So I had this thought over Easter: Is it sacrilegious to make deviled eggs with eggs that you get from the Easter Bunny? 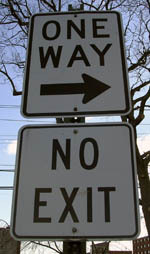 Every once in awhile I like to pass along a helpful hint for living. I got this one from my friend, Mike, who is an EMT, but I think it could easily apply to anyone in their daily life: "If it's wet and sticky and not yours, don't touch it!". If you went to the gift shop of a nudist colony, could you buy a souvenir T-shirt? I took this at the University where I am taking a class. I expected there to be a huge pile of cars at the end of this road but, for some reason, there wasn't. No new recipe this month - but check our archives for some ideas! When my #1 child, Stefanie, went to Pitt as a freshman in 2001, the last thing I gave her, with a little speech was a roll of Duct Tape. I said something like "friends will let you down, things will break and need fixing and I won't be here to help, but this will never, ever let you down." She thought it was the dumbest thing in the world and very stupid. A hip young man goes out and buys the best car available, a brand new Ferrari 550. It is also the most expensive car in the world, and it costs him $500,000. He takes it out for a spin and stops for a red light. An old man on a moped (about 75 years old) pulls up next to him. The old man looks over at the sleek, shiny car and asks, "What kind of car ya' got there, sonny?" "Because this car can do up to 320 miles an hour!" states the young dude proudly. The moped driver asks, "Mind if I take a look inside?" "No problem," replies the owner. So the old man pokes his head in the window and looks around. Then sitting back on his moped, the old man says, "That's a pretty nice car, all right . . . but I'll stick with my moped!" Just then the light changes so the guy decides to show the old man just what his car can do. He floors it, and within 30 seconds the speedometer reads 160 mph. Suddenly, he notices a dot in his rear view mirror. It seems to be getting closer! He slows down to see what it could be and suddenly, whhhoooossshhh! Something whips by him, going much faster!!!! "What on earth could be going faster than my Ferrari?!" the young man asks himself. He floors the accelerator and takes the Ferrari up to 250 mph. Then, up ahead of him, he sees that it's the old man on the moped. Amazed that the moped could pass his Ferrari he gives it some more gas and passes the moped at 275 mph. Whoooooosh! He's feeling pretty good until he looks in his mirror and sees the old man gaining on him again. Astounded by the speed of this old guy he floors the gas pedal and takes the Ferrari all the way up to 320 mph. Not ten seconds later he sees the moped bearing down on him again. The Ferrari is flat out and there's nothing he can do. Suddenly the moped plows into the back of his Ferrari, demolishing the rear. The young man jumps out, and unbelievably, the old man is still alive!!! He runs up to the mangled old man and says, "Oh my God! Is there anything I can do for you?" The old man whispers with his dying breath, "Unhook . . . my suspenders from your side-view mirror. 7. If you don't pay your exorcist, you can get repossessed.